To kick off March Madness, we sent the message below to our full email list sharing President Obama’s bracket picks . If you’d like to receive updates like this in the future, you can sign up for our email list here. For many of us, sports give us our first lessons in leadership. Whether on the field or on the court, between the lanes or in the ring, athletics teach us to examine our strengths and weaknesses, understand the importance of teamwork and coaching, and develop the grit it takes to persevere after a tough loss. Whether teaming up with Steph Curry to encourage mentorship through the My Brother’s Keeper Alliance, coaching his daughter’s basketball team—or sitting courtside at the UNC-Duke game in a 44 bomber jacket—President Obama has always embraced his love of sports, and his belief that they can bring communities together. That’s why we’re working to bring a Program, Athletic and Activity Center to Jackson Park as part of the Obama Presidential Center. And it’s why we’re sharing his March Madness brackets with you today. Want to see how your bracket stacks up? 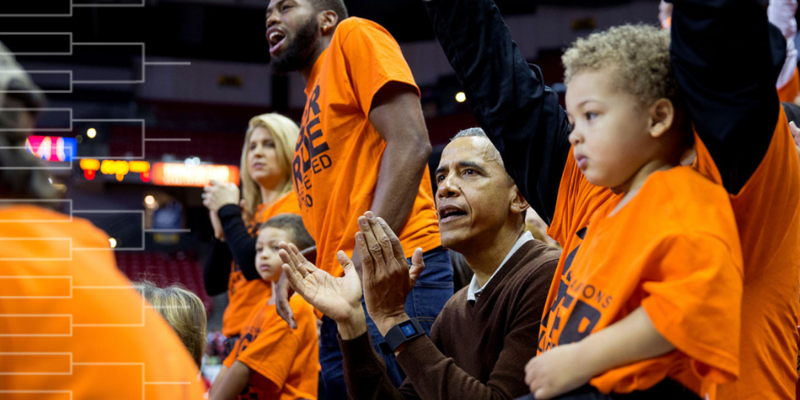 Check out President Obama’s Final Four picks and full brackets for both the men’s and women’s tournaments at: https://go.obama.org/2019-bracket. No matter where these teams place in the Big Dance, they’re showing us how sports can be a force for bringing communities together and showing us how much we have in common—even if we root for different teams. P.S. Know someone who might want to see the President’s picks? Forward this email so they can see how their brackets compare.